Apnea explores the dimension of the emotions of migrants who venture out to cross the sea. Apnea proposes an inner itinerary that we can all recognise: a cartography of feelings and fears mapped using interactive immersive technologies and an exhibition of objects that were salvaged from the sea. Apnea ’s audio-visual contents were realized in Lampedusa. 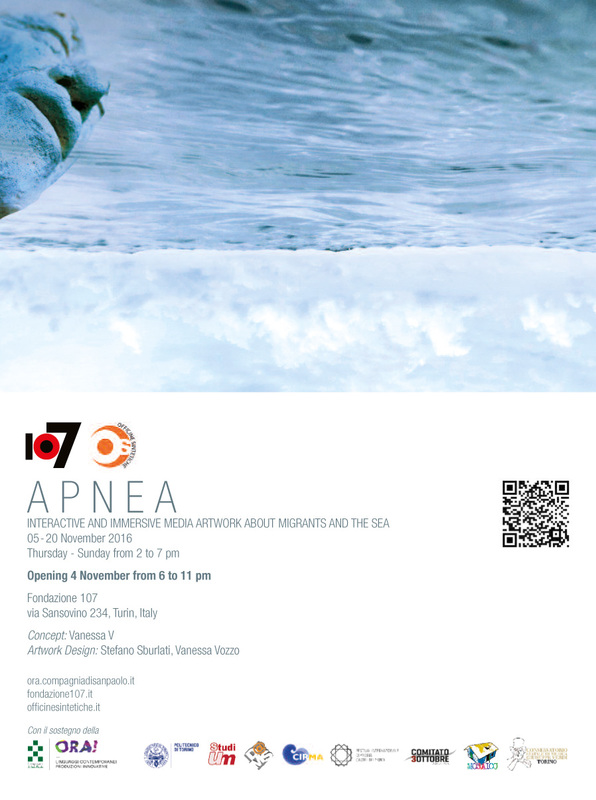 The Apnea project came about when the Fondazione 107 for Contemporary Art came together with the platform of the Interactive Media Art Officine Sintetiche, which involves the CIRMA, the Department of Humanities at the University of Turin and the Department of Cinema Engineering and Communication Media at Turin Polytechnic. The International Castel dei Mondi Festival at Andria later also joined as a supporting partner. In May 2016, the project won the Ora! call for tender issued by the Company of St Paul, which enabled it to launch into a pre-project phase of training and research that led to the organisation of a public event in March 2016. The artwork develops on an idea devised by Vanessa Vozzo and is curated by Vanessa Vozzo and Stefano Sburlati, who started conducting research about migrants and the sea in 2015. Since January 2016, Stefano and Vanessa have been guiding groups of students and managing complex research in immersive and interactive technologies. Since then, Apnea has involved students, researchers and lecturers from Turin Polytechnic and Turin University, as well as extramural professionals: altogether, a large group of more than 20 people. Apnea uses interactive and immersive technologies for the purpose of awareness raising, basing its approach on generating a personal, emotional sense of involvement in each individual. The visitor’s exploratory experience unfolds through three episodes or environments that offer different degrees of immersiveness and interactivity: a journey into our own emotions. Visitors start this journey with a display of photographs, videos, pieces of writing and original artefacts found on the wrecks (especially the 3 October 2013 wreck) or brought on land by individual migrants. These are taken out of context and located in a procedural soundscape that is recomposed in real time. – the first is a space with an interactive projection that refers to a dive to the seabed, to primordial places that conflict with raw, real voices. As visitors move through the audio-visual environment, they modify it in real time. – the second is a 360° video that enables visitors to plunge into the seas around Lampedusa. The performative dimension here can really take your breath away. Creating this part of the work involved intense periods of research for shooting the footage, editing it, creating the spatial audio and programming a specific player.